Woody plant cover and species composition play an important role in defining the type and function of savanna ecosystems. Approximately 2000 sites in the Kruger National Park (KNP) were surveyed by F.J. Venter over a period from 1985 to 1989, recording vegetation, soil and topological characteristics. At each of these sites (approximately 20 m × 20 m each), woody vegetation cover and species were recorded using a rapid, Braun-Blanquet classification for three height classes: shrub (0.75 m - 2.50 m), brush (2.50 m - 5.50 m) and tree (> 5.50 m). The objective of this study was to re-analyse the vegetation component of the field data, with a specific focus to provide a spatially explicit, height-differentiated, benchmark dataset in terms of species occurrence, species richness and structural canopy cover. Overall, 145 different woody species were recorded in the dataset out of the 458 species documented to occur in the park. The dataset describes a woody layer dominated by a relatively small number of widely occurring species, as 24 of the most common woody species accounted for all woody species found on over 80% of all sites. The less common woody species (101) were each recorded on 20 sites or less. Species richness varied from 12 to 1 species per site. Structural canopy cover averaged 9.34%, 8.16% and 2.89% for shrub, brush and tree cover, respectively. The dataset provides a useful benchmark for woody species distribution in KNP and can be used to explore woody species and height class distributions, as well as comparison with more recent or future woody vegetation surveys. CONSERVATION IMPLICATIONS: The results provided evidence that large-scale, woody vegetation surveys conducted along roads offer useful ecosystem level information. However, such an approach fails to pick up less common species. 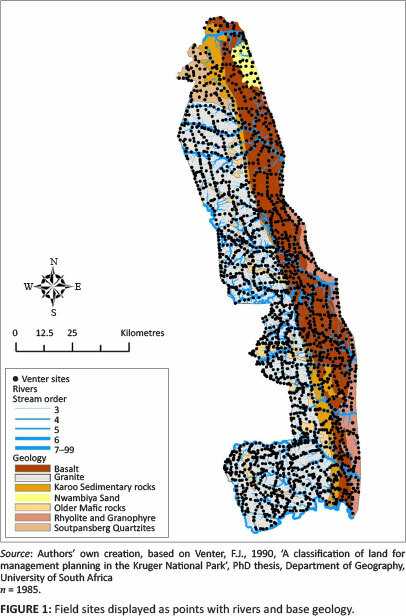 The data presented here provided a useful snapshot of KNP woody vegetation structure and composition and could provide excellent opportunities for spatio-temporal comparisons. Woody plant cover and species composition play an important role in defining the type and function of savanna ecosystems (Bucini & Hanan 2007; Sankaran, Ratnam & Hanan 2008; Sankaran et al. 2005; Wagenseil & Samimi 2007). When assessing the vulnerability or resilience of savannas to environmental or anthropomorphic drivers, changes in woody composition and density are often cited as evidence (Vanak et al. 2012). Analysis of woody plant height and locality data can have useful application to current issues in the Kruger National Park (KNP), South Africa. For example, monitoring of the various thresholds of potential concern, as outlined by Biggs and Rogers (2003), aid KNP managers to monitor and assess biodiversity levels (Grant, Peel & Bezuidenhout 2011) and provide benchmark analysis for assessing when specific management interventions are needed (Scholes & Kruger 2011). Within the KNP, considerable scientific and management effort has been invested into monitoring and studying woody vegetation dynamics, yet large-scale detailed vegetation cover and species data are often limited, making it hard to generalise results (Sankaran et al. 2008). Whilst more recent studies employing advanced remote-sensing technology have provided useful information about the woody plant layer (Asner & Levick 2012; Bucini et al. 2010; Levick, Asner & Smit 2012; Smit & Asner 2012), one essential gap in these analyses of woody cover change is a comprehensive, KNP-wide, historical dataset for comparison. Earlier studies of the KNP woody vegetation layer have been focused mostly on taxonomical descriptions, with ecological groupings created to broadly define landscape-scale management areas (Coetzee 1983; Coetzee & Nel 1978; Gertenbach 1983). In more recent years, a variety of methods have been used to estimate the percentage of woody cover or changes in woody cover for different KNP areas. These studies fall into two broad categories: detailed field-based surveys in limited, but representative areas and remote-sensing-based studies over larger scales. Using a combination of aerial and fixed point photographs ranging from 1940 to 1998, along with field sampling, Eckhardt, Van Wilgen and Biggs (2001) reported woody cover increases of 12% on granite substrates (inclusive of trees and shrubs) and decreases of 64% on basalt substrates. Within the long-term fire exclusion plots (experimental burn plots), several studies have explored the role of fire and herbivory in various rainfall regimes within the park (Van Wilgen et al. 2000). Using remote-sensing techniques, such as airborne light detection and ranging (LiDAR), canopy cover, vegetation height cover and canopy structure was accurately estimated over thousands of hectares at a 0.5 m - 1.0 m horizontal resolution (Asner, Levick & Smit 2011; Wessels et al. 2011). With the advances in satellite remote-sensing technology, Bucini et al. (2010) used a combination of optical and radar imagery to estimate the percentage of woody cover over the entire KNP. In addition to producing a woody cover percentage map for KNP at a horizontal resolution of 90 m, this was accompanied by a standard deviation map (at the 1 km grid scale), which can be used as a metric for woody cover heterogeneity. Bucini et al. (2010) suggests that the percentage of woody cover ranges between 0% and approximately 65% across the KNP landscape. To date, this is the most widely 'accepted' woody cover percentage map for KNP and it is extensively used in current research projects (e.g. De Knegt et al. 2011; Smit et al. 2013). However, this map does not differentiate between vertical structure and, as such, includes all woody cover, irrespective of height class. This lack of vertical information in the Bucini et al. (2010) woody cover map is a critical gap, especially considering the management concern around the diminishing populations of tall (> 5.0 m) trees over recent years, as well as the concern with bush encroachment in certain areas of the park (Buitenwerf et al. 2012). This highlights the need for both current and historical data for detecting trends in woody vegetation structure and composition. Between the descriptive studies of the 1970s and 1980s and the more recent remote-sensing studies is the large and comprehensive field effort of Venter (1990). In the middle-to-late 1980s, Venter (1990) conducted a study in the KNP in which he used a rapid Braun-Blanquet (BB) survey method (Coetzee & Nel 1978) to describe vegetation at 1985 observation sites (Figure 1). Each selected site was visually examined over a 20 m × 20 m quadrant to determine the species present and the estimated canopy cover for three height classes (shrub 0.75 m - 2.50 m, brush 2.50 m - 5.50 m and tree > 5.50 m). The assessment relied on ordinal scales rather than specific measurements to describe woody cover in each height class. For each species identified at a site, three BB codes were recorded for each height class using the number of canopy diameters separating occurrences of that species (see Online Appendix, Table 1). To allow multiple sites to be efficiently assessed, sites were selected systematically approximately every 2.5 km along tourist and management roads over the entire KNP (Figure 1). The results of soil, vegetation and topological features present at sites were used, along with stereoscopic aerial photography, to create functional land type maps for management and to estimate the area percentage of various land type and terrain unit areas (Venter 1990). Venter (1990) and Venter, Scholes and Eckhardt (2003) provided a critical analysis of landscape-level functionality in soils, topology and ecozones. However, we argue that further value can be gained by additional analysis of the original dataset. Significant management changes and climatic conditions occurred in the 1990s, including management changes for elephant population (Shannon et al. 2008; Whyte et al. 1999), fire management (Van Wilgen et al. 2000), artificial water provision (Smit, Grant & Devereux 2007), herbaceous-layer monitoring (Zambatis 2005) and the largest drought recorded (Viljoen 1995; Zambatis & Biggs 1995). A methodical re-analysis of the Venter (1990) dataset would therefore provide a valuable benchmark for comparison with later datasets to explore the ecosystem response to such large-scale ecosystem and management alterations. This dataset provides a unique opportunity to assess park-wide, field-based data on woody species richness, occurrence and canopy cover at various height classes. How is woody vegetation spatially distributed in the KNP landscape? Do the size classes (shrub, brush or tree) of a particular species have a different spatial distribution across the landscape? How many species were reported using a spatially diverse, yet rapid, field monitoring campaign? Does woody species richness vary widely throughout the KNP? Does woody species richness vary with size classes? What was the structural distribution of KNP woody cover in terms of shrub (0.75 m - 2.50 m), brush (2.50 m - 5.50 m) and tall trees (> 5.50 m) in the late 1980s? Over and above the ecological significance of our results, we believe that the lessons learned from our re-analysis will provide critical information to inform and guide future woody vegetation monitoring programmes. Originally, Venter (1990) utilised the Statistical Analysis System (SAS) statistical package (SAS Institute Inc. 1988) for analysis of constituent soil, grass and tree species within land type and terrain unit classifications from the 1985 sites. These same field data files were translated into database and spreadsheet formats and were joined with site points digitalised from 1:50 000 scale maps using ArcGIS (Environmental Systems Research Institute [Esri] 2011) to create point-based maps of structural woody cover, species counts and species occurrence. From the original 1985 woody presence sites, 1820 sites were totalled and linked with the digitised sampling locations (the reduction in sites is a result of missing location data for 165 sites). The assessment sites were sorted to include only woody plant classifications and the BB data were used to calculate cover estimations for each of three height classes (shrub 0.75 m - 2.50 m, brush 2.50 m - 5.50 m, tree > 5.50 m). As the BB categories varied within a pre-set percent estimate (see Online Appendix, Table 1), BB cover codes were assigned to low, average and high category values to explore potential variations in cover estimations. Thus, a BB record of '2a' denoted a range of 5% - 12% crown cover with 2-3 canopy diameters separating canopies. The subsequent woody cover calculations would assume 5% cover as a minimum estimate, 8.5% as a mean estimate and 12% as a maximum estimate. For each assessment site, all the recorded species were summed within their respective height classes to estimate a minimum, mean and maximum canopy cover (assuming no canopy overlap within a height class). In addition, the number of non-zero species recorded at each site and within each height class was summed to estimate a woody plant species richness value. Table 1 provides an example of woody data recorded for a typical Venter site (#382) and the results of calculations for woody canopy cover and species richness. In addition, the five woody species recorded at the site (Combretum zeyheri, Terminalia sericea, Acacia exuvialis, Combretum apiculatum and Combretum collinum) were included as presence points in their respective height classes and their canopy covers were used in subsequent canopy cover estimates. Species occurrence data were sorted and ranked for each site to assess the most and least commonly recorded species with their respective number of sites. Two methods were used to interpolate the point data into continuous grids. For species-based maps, an estimation of probability of occurrence was calculated by the Indicator Kriging (IK) method (Lloyd & Atkinson 2001). IK is a non-parametric method of interpolation that was chosen because all species were recorded at each site, thus providing true absence or presence data. To develop continuous spatial maps for selected woody species, presence or absence data were compiled from the occurrence data and used to interpolate the binary data into a continuous map that indicated relative probability of occurrence (Auerbach & Shmida 1987). The semi-variogram was estimated using a maximum of five and a minimum of two neighbouring data points. Data at unknown locations were estimated using the binary input values of known locations and the semi-variogram (Isaaks & Srivastava 1989). 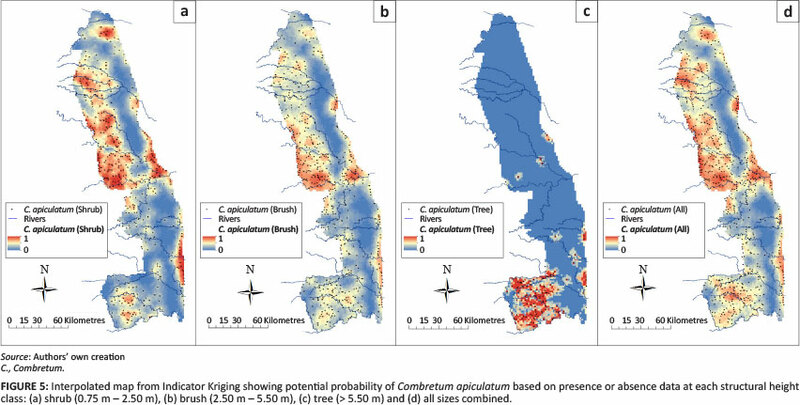 For height-based, structural cover and woody species richness maps, continuous maps were obtained through Empirical Bayesian Kriging (EBK) (Pilz & Spoeck 2008). EBK was chosen to create interpolated maps as it accounts for user error in estimating the underlying semi-variogram through repeated simulations, which is not achieved by ordinary Kriging methods. One hundred simulations were run to estimate the semi-variogram with a search neighbourhood maximum of 15 and a minimum of 10 neighbouring data points (Delfiner 2009). Validation of the interpolation techniques was conducted using the root mean square error (RMSE) which estimates the prediction error. The RMSE ranges from 0 to ∞, where values of 0 indicate a perfect fit (Ritter & Munoz-Carpena 2013). Predicted values were extracted at the same point locations where field data were collected to compare observed versus predicted values. Prediction errors can be found in the Online Appendix, Table 2. All interpolation analyses were conducted using ArcMap 10.1 (Esri 2011). RMSE values were calculated using the hydroGOF (Zambrano-Bigiarini 2013) package in R v.3.0.2 (R Development Core Team 2013). The following sections provide summary information for woody species frequency, selected species maps, species richness and structural cover. Whilst each following section provides a brief summary with example tables and maps, more comprehensive field data files and metadata are available through the South African National Parks (SANParks) data management system (http://dataknp.sanparks.org). In viewing the diversity and abundance of individual woody tree species recorded by the Venter (1990) survey on 1985 woody presence sites, 145 different species were recorded from a possible total of 458 species known to occur in the park (Coetzee 1983; Van Wyk 1984). 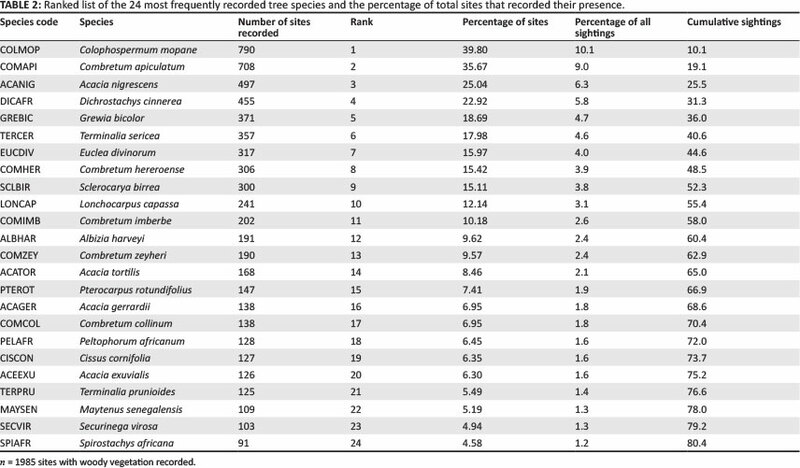 Of these 145 species recorded, 24 species account for over 80% of all occurrences recorded (Table 2). Seventy percent of all woody species recorded were found on 20 sites or less. Just under half of the recorded species (65 of 145) occurred in five or less sites. These results show that even with a significant level of spatially diverse field sites (n = 1985 locations), locating and monitoring less common woody species remains a significant challenge. From the original 1985 woody presence sites, 1820 sites were totalled and linked with the digitised location sampling points to create species occurrence and richness maps. For all interpolated maps, the output grid resolution size was 1.7 km, which is the minimum distance between points for each grid to contain at least one sample point. Species occurrence maps for four of the six most common woody species were created for each of the three height classes to show the utility of the Venter (1990) data to estimate the probability of presence or absence. Figures 2a-2d show interpolated maps created from IK using presence or absence data for T. sericea (silver cluster leaf) at each height class and for all height classes combined. The Figures show similar presence maps for each height class in the southwest KNP (Pretoriuskop) region, with some wider distribution of shrub and brush heights in the northern KNP. 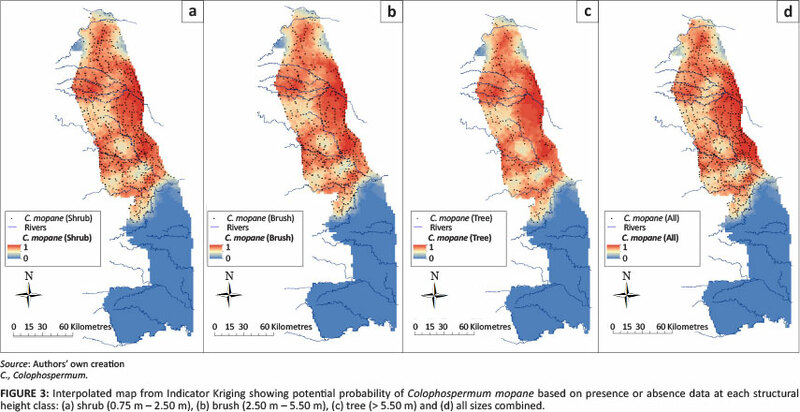 Figures 3a-3d show the interpolated maps for Colophospermum mopane (mopane) showing quite similar probability distributions for all height clfasses, along with the expected distribution northwards from the Olifants River. 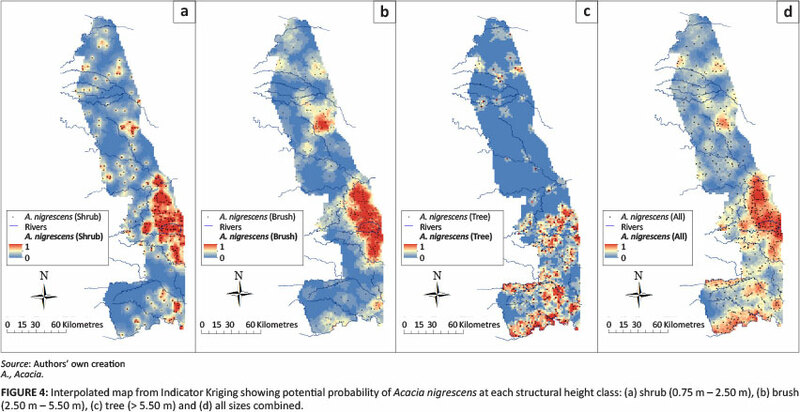 The presence uniformity amongst the tree, brush and shrub height classes was not observed for Acacia nigrescens (knob thorn) (Figures 4a-4d) nor for C. apiculatum (red bush willow) (Figures 5a-5d). The interpolated A. nigrescens maps showed similar probabilities for shrub and brush heights, with tall trees distributed more widely in riverine areas and the extreme southern KNP. Overall, woody species richness for all heights varied from 12 to 1 species recorded per site, with a mean of 3.95 species and a standard deviation (s.d.) of 1.80 (Table 3). Over 90% of sites had 6 or less recorded species, with 3and 4 species as the mosi commonly encountered. Within the height-differentiaied classes, the shrub layer had the highest species richness imean = 2.76, s.d. = 1.43), with declining levels for brush (mean = 1.82, s.d. = 1.16) and tree (mean = 0.93, s.d. = 1.00) heigh i clas ses. 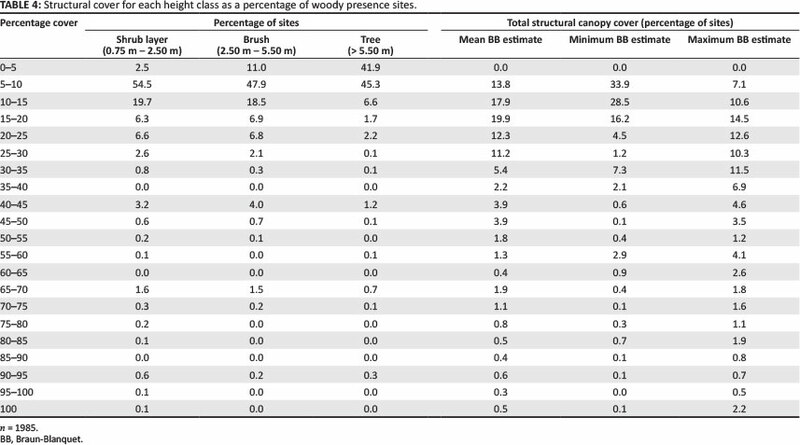 Figures 6a-d show the total woody species richness along with the interpolated species richness for each height class. The highest species richness for the shfub layer was found in the southeast region dominated by basalt areas, whereas brush and tree species richness (Figures 61b and 6c) were higher in the south-southwest granite-ecca shales regions. The majority of the shrub layer (54.50%) was distributed within the 50% - 10°% cover range, with significant patches in the higher cover range. The brush layer had a similar distribution to the shrub layer, with 47.9% of cover totals in the 5% - 10% cover range. Tall trees were mora skewed towards lower cover totals, with 41.9%o and 45.3% of all sites in the 0% - 5% and 5% - 10% cover ranges, respectively (Table 4). For each woody monitoring site, as shown in Table 1, the various species covers within a height class were totalled using the mean, minimum and maximum cover category values. Assuming no overlap amongst height classes, three estimates were created for each site and binned according io total cover, as shown in Table 4. Using; the different BB cover category vgluations, most KNP sites fell under the 35% total cover. Table 4 shows the maximum estimation, with a longer-tailed distribution of total cover, so that about 87% of all sites fell below 60% total cover. Figures 7a-7d show interpolated percentage cover maps for trie three height classes (Figures 7a-7c) and a total canopy cover created from the mean BB category value and assuming no overlap between height layers (Figure 7d). The most prevalent cover amounts, especially in the central and southern KNP were contributed from the brush class (Figure 7b). Given that no data concerning the overlap of woody canopy were recorded amongst height classes, one singular estimate of total woody cover using the dataset is not supportable without further analysis and comparison with additional datasets such as Bucini et al. (2010) and Asner et al. (2011). Given the significant resource constraints and technical challenges in monitoring woody vegetation, efforts to analyse historical data can be useful and efficient for addressing current research and management concerns and for providing historical context. The Venter (1990) dataset provides a useful and critical benchmark for analysing woody presence or absence and canopy cover for subsequent ecosystem management changes implemented since the 1990s. In reflecting on the initial research questions in this article, the following answers can be offered. The Venter (1990) dataset describes a woody layer dominated by a small number of commonly occurring species (24) that are found in a large number of sites (> 80%) across the KNP, with a concomitant large number (121) of different species occurring in the remaining 20% of sites. In addition, higher species numbers are found within the smaller height classes, with diminishing diversity found in the taller height classes. This is not surprising as many woody species do not grow into the taller height classes. In addition, the Venter (1990) dataset has utility in providing spatially explicit presence or absence data to characterise both species occurrence and structure maps. One interesting feature worth further exploration is the different spatial distributions of the various height classes of the same species across the KNP. Certain species (T. sericea and C. mopane) show similar presence patterns regardless of height classes, whilst other species (A. nigrescens and C. apiculatum) show a break in presence distributions for tall tree classes. The database shows promise in identifying which species and structural classes of specific species may be more sensitive to additional ecosystem drivers (Currie 1991). In terms of monitoring species occurrence, analysis of this database shows that even with a large sampling regime (n = 1985), more than two-thirds of woody species known to occur in the KNP were not ever recorded during the extensive sampling campaign and that 73.0% of recorded species are found in less than 1.5% of the sites (i.e. 30 sites or less). This may prove problematic for designing random monitoring schemes to track less common species. Our results suggest that a sampling design, such as the one employed here, will be more effective in detecting dominance changes for the common species. However, targeted monitoring at preselected, non-random sites may be needed to monitor the less common species occurring in the tail of the species dominance curve. These rare species may respond to system changes before the more dominant species and directed monitoring efforts may be needed. Species richness varies significantly both horizontally and vertically. The southern KNP has higher woody species richness with differing levels depending on area and height class. These differences can be explored further with respect to environmental drivers such as fire (frequency and intensity), browsing (including elephant effects) and rainfall. The Venter (1990) dataset describes a KNP landscape mostly dominated by shrub and brush, with small percentage cover contributions from tall trees. Visual assessment of the interpolated maps shows that tree locations are often near river courses and are mostly found in the higher rainfall regions in the southern KNP. In all height classes, woody cover was greatest nearest to perennial rivers, in accordance with Smit et al. (2013). Depending on which BB cover estimate is used for each height class and which overlap assumption is used, woody cover estimates for each height class can be calculated and then combined to form an estimate of total woody cover. In this article, no attempt was made to compare the woody cover estimates with other woody cover totals, such as Bucini et al. (2010) or Asner et al. (2011), as these studies have used quite different technical means and spatial scales to estimate woody cover. 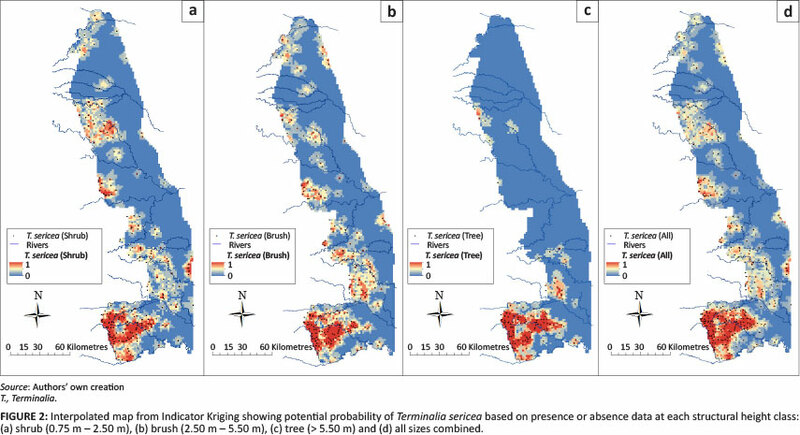 Still, a comparison of estimations may be helpful to determine methods for future monitoring programmes and their connection to developing remote-sensing technologies. There are advantages and drawbacks to the method used here for estimating woody cover. Advantages include that the Venter (1990) dataset provides a somewhat quantitative snapshot into the late 1980s, with on-site measurements for approximately 2000 locations recording both species presences and their general height distributions. Venter (1990) sampling locations are distributed mainly along roads for efficient access and cover a wide range of land types and terrain units. BB cover surveys are rapid site estimates. In this case, all estimates were by one individual with significant expertise. In addition, cover estimations for height classes include direct observations of land type or terrain unit features for additional comparison with other research and monitoring efforts. Potential drawbacks include the concept that the total summed cover within a size class is not simply the sum of the recorded species covers, as no information concerning overlap or within-site distribution was recorded. Whilst a large number of sampling points exist, they are not continuous like remotely sensed datasets (Bucini et al. 2010). Matching different sampling techniques employed over different scales makes it challenging to compare and establish how woody cover is fluctuating over a heterogeneous landscape. When estimating the canopy separation between occurrences of a particular species, canopy interactions or overlaps with other species may be missed. In reducing the set into more localised analysis for specific land types or terrain units, sampling bias along roads may be evident. The dataset presented in this article provides a useful benchmark for woody species distribution across the KNP in middle-to-late 1980s. The data can be used to explore woody species and height class distributions spatially explicitly as well as for the creation of functional groups of species for comparisons with later SANParks woody vegetation composition assessment (wVCA) datasets compiled in 1996, 2002, 2005 and 2008 (Zambatis 2005). The results have particular value as they represent the woody layer in light of management practices during that time, before significant changes in terms of fire management, elephant population control and artificial water point provision. Thus, the dataset can be used as an historical point in time to compare with subsequent woody datasets derived from fieldwork and remote sensing. As there is an apparent concern over the loss of tall trees and a densification in the lower height classes, woody vegetation monitoring is of vital importance for KNP to maintain structural heterogeneity. The ability to generate canopy cover maps and probability occurrence maps at the species level and height class provides a detailed account and benchmark of species demographic profiles throughout the park. Whilst this study presented the database and its initial creation and analysis, significant opportunities lie ahead in its use in more detailed analysis and scientific applications. The authors would like to acknowledge the NASA Land-Cover/Land-Use Change (LCLUC) Program, 2009-2012 (Reference #NNX09AI25G) for funding. In addition, the authors also acknowledge the United States of America Department of State through their Fulbright Scholar programme. We would also like to thank SANParks and the Scientific Services Division in KNP for access to the data. G.A.K. (University of Florida) was the project leader and provided the first-level database preparation and analysis. R.S. (SANParks) performed all spatial statistical analysis and developed all continuous map estimates. I.P.J.S. (SANParks) provided both conceptual and detailed analysis methodologies in addition to guiding data interpretation. F.J.V. (SANParks) recorded all field data and provided conceptual and detailed contributions to the analysis.